Neeha Zaidi is at the Sidney Kimmel Comprehensive Cancer Center, Johns Hopkins University School of Medicine, Baltimore, Maryland 21287, USA. Elizabeth M. Jaffee is at the Sidney Kimmel Comprehensive Cancer Center, Johns Hopkins University School of Medicine, Baltimore, Maryland 21287, USA. Instructing the immune system to recognize and kill tumours, an approach termed cancer immunotherapy, has transformed the clinical treatment of certain types of malignancy. Prominent among these therapies are immune-checkpoint inhibitors, which block the action of proteins that dampen immune-cell responses against tumours. For example, antibodies can be used to interfere with the inhibitory protein PD-1, which is present on T cells, a type of immune cell that attacks tumours. Immune-checkpoint inhibitors have been most successfully used to treat cancers, such as melanomas, that are well infiltrated by T cells and have a large number of genetic mutations1,2. A subset of these mutations might generate neoantigens — altered protein sequences that are uniquely produced in cancer cells and are recognized as foreign by the immune system3. Most cancers, however, including brain tumours called glioblastomas, do not respond to immune-checkpoint therapy. These non-responsive tumours typically have a low level of mutations and express few neoantigens; that is, they have an immunosuppressively ‘cold’ tumour microenvironment . They therefore fail to attract T cells that can infiltrate the tumour. Finding ways to boost an immune response to such tumours is an ongoing challenge. Writing in Nature, Keskin et al.4 and Hilf et al.5 report their progress in this area, and present the results of separate phase I clinical trials in which people with glioblastoma were treated with a personalized vaccine containing neoantigens that were specific to the individual’s own tumour (Fig. 1). Figure 1 | Using immunotherapy to target human brain tumours. Keskin et al.4 and Hilf et al.5 report the outcomes of phase I clinical trials that tested ways of boosting immune responses against glioblastoma tumours, which are hard to target with immunotherapy. Both authors tried to enhance immune responses against tumour-specific, mutant versions of proteins, termed neoantigens, that are displayed by being bound to receptors on a person’s tumour cells. Keskin et al. gave participants vaccines consisting of personalized sets of peptides (protein fragments) that matched the amino-acid sequences of their specific neoantigens. Hilf et al. combined such a personalized vaccine with one that targets non-mutant proteins common to this type of tumour (not shown). Both papers report that vaccination boosted immune responses involving CD8+ T cells and CD4+ T cells that recognized the neoantigens. However, this did not prevent cancer-associated death. Perhaps this is because T cells entered a dysfunctional state termed exhaustion, as reported by Keskin and colleagues. Entry into this state can be mediated by a T-cell-receptor protein called PD-1. Perhaps future studies will test whether blocking exhaustion by using antibodies that target PD-1 might enable such tumour-targeting T cells to remain active and secrete the cytokine molecules that aid tumour-cell destruction. Keskin et al. gave eight people who had undergone surgery to remove their tumour, and had received radiotherapy, a vaccine containing up to 20 protein fragments corresponding to neoantigens expressed in the person’s tumour. These neoantigens were chosen by analysing the tumour material removed during surgery. Analysis of blood samples from the people who had been vaccinated then revealed whether types of T cell called helper CD4+ T cells and killer CD8+ T cells were responding to these neoantigens. The authors found that the vaccine failed to elicit a robust T-cell response in the participants who had also been treated with the drug dexamethasone, which is a potent steroid immunosuppressant used to decrease swelling around the brain. The two people who had not received dexamethasone exhibited a neoantigen-specific T-cell response consisting of predominantly CD4+ T cells as well as CD8+ T cells. Notably, these neoantigen-specific T cells secreted proteins called cytokines, which are involved in killing tumour cells. These two people had T cells that expressed surface proteins known to be a hallmark of T cells that have acquired memory status — a characteristic that enables a faster and more robust immune response to a particular neoantigen if it subsequently re-emerges. However, all the vaccinated patients, even the two who responded, ultimately died of the cancer. One key finding of this study relates to the T cells present in surgically removed samples of recurring tumour growth in one of the responders’ tumours. In this case, the neoantigen-specific T cells in the tumour expressed proteins indicating that the cells had entered a dysfunctional state termed exhaustion. This state corresponds to a decreased ability to recognize and kill cancer cells. Exhausted T cells can sometimes be reinvigorated using immune-checkpoint inhibitors. Hilf et al. tested a strategy that used two types of vaccine. One of these, similar to the one used by Keskin and colleagues, consisted of a personalized neoantigen vaccine. The other vaccine consisted of non-mutated protein fragments corresponding to tumour-associated proteins present on cancer cells. This latter vaccine was not personalized to match each individual’s proteins — the tumour-associated proteins were identified through analysis of 30 glioblastomas, using techniques to identify proteins that are strongly associated with this type of tumour. Of 15 people who had undergone surgery to remove their tumour and who were receiving chemotherapy, 4 received the non-personalized vaccine only and 11 received both vaccines, given consecutively. A couple of the people enrolled dropped out of the trial. A total of 13 people who had received the non-personalized vaccine generated an immune response that was evaluated, and 12 of these 13 individuals had CD8+ T cells that could recognize at least one protein in the non-personalized vaccine. The personalized vaccine induced CD4+ T-cell responses targeting neoantigens in 8 out of 10 people who received the personalized vaccine and generated immune responses that were evaluated. The two papers show that it is possible to make T cells that target some of the few neoantigens expressed by glioblastomas. Similar neoantigen-targeted vaccine approaches were previously tested6,7 in early-phase clinical trials for melanoma, which, unlike glioblastoma, is a type of cancer that has a high level of mutations and neoantigens. 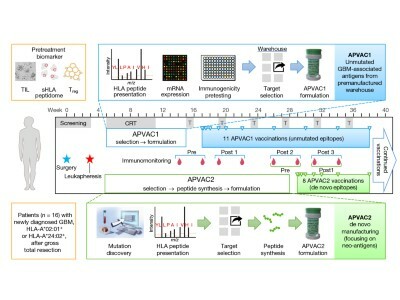 These studies by Keskin, Hilf and their respective colleagues highlight several key aspects that underscore the current limitations of personalized-vaccine therapy, as well as the potential benefits. 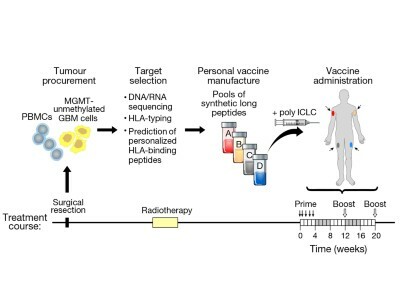 People with cancer could be receiving other treatments, which might limit the effectiveness of immunotherapy vaccines, as was observed by Keskin and colleagues for the participants who received steroids. By contrast, Hilf and colleagues did not report that T-cell responses were affected by the chemotherapy received by the people in their study. Although the sample sizes in these trials were small, the results suggest that the timing of vaccine administration should be carefully considered when designing future clinical trials in which multiple immunosuppressive agents are being used for treatment. Several studies6–8 have shown that neoantigens are potent T-cell activators, and Hilf et al. demonstrate clearly that non-mutated proteins can also drive robust CD8+ T-cell responses. This begs the question of which approach is superior for this type of therapy, or, indeed, whether combinations of mutated and non-mutated proteins might make the most effective vaccines, particularly for tumours that do not express many neoantigens. As in vaccine studies in people with melanoma6,7, both glioblastoma trials preferentially elicited neoantigen-specific CD4+ T cells, rather than CD8+ T cells. This was despite Hilf et al. selecting neoantigens that would be expected to trigger CD8+ T cells only. Interestingly, a strong CD8+-T-cell response was raised only by the vaccine composed of non-mutated proteins. Future studies should explore the role of neoantigens and non-mutated proteins in eliciting cancer-killing CD8+ T cells, as well as the relative importance of responses of CD4+ T cells compared with CD8+ T cells to these proteins. Although both studies demonstrated an immune-cell response that targeted tumours, most people who participated in the trials died from their cancer. Perhaps this was because the tumour-targeting T cells became exhausted, as suggested by the results of Keskin and colleagues. To get a more successful outcome in the future, combination therapies might be needed. For example, the administration of a vaccine along with checkpoint inhibitors might improve the quality of tumour-infiltrating T cells and tackle T-cell exhaustion. There is growing evidence that, to achieve the most effective immunotherapy results, it is necessary to enhance the number and quality of T cells infiltrating a tumour, ensuring the ‘tuning up’ of immune cells to effectively kill cancer cells9. Combinatorial approaches might be particularly necessary in immunologically cold tumours8,10. A possible next step to build on the findings of Keskin, Hilf and their colleagues would be to conduct clinical trials of such combinatorial approaches. This approach has been effective in an animal model of pancreatic cancer8. These two studies show that T-cell responses can be boosted in cancers in which this was thought to be difficult. The findings suggest that further refinement of such approaches is a promising avenue of investigation in the search for therapies that target glioblastoma. Yarchoan, M. et al. N. Engl. J. Med. 377, 2500–2501 (2017). Yarchoan, M. et al. Nature Rev. Cancer 17, 209–222 (2017). Hilf, N. et al. Nature 565, 240–245 (2019). Sahin, U. et al. Nature 547, 222–226 (2017). Kinkead, H. L. et al. JCI Insight 3, e122857 (2018). Friaetta, J. A. et al. Nature Med. 24, 563–571 (2018). Popovic, A. et al. J. Clin. Invest. 128, 3209–3318 (2018). E.M.J. serves on the scientific advisory boards of four immunotherapy companies: CSTONE, Genocea, Adaptive Biotech and DragonFly. E.M.J. receives grant money from Aduro Biotech, Hertix and Bristol-Myers Squibb and has the potential to receive royalties on a vaccine licensed to Aduro Biotech. Also, E.M.J. is the president of the American Association for Cancer Research and serves as the chairperson of the National Cancer Advisory Board.